The Muppets' YouTube sensation "Bohemian Rhapsody" has been nominated for a People's Voice Webby Award in both the Viral and Music Categories! The Muppets need your support to bring home a win. 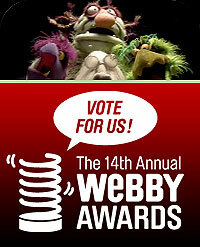 Please vote for the Muppets' "Bohemian Rhapsody" today by going to the following pages and registering: the Webby "Music Video" category and the Webby "Viral Video" category. Fans will need to vote two times, once for each category. SesameStreet.org is also nominated in the "Living" category for one of the best family and parenting websites. Voting ends Thursday April 29th. The Muppets' version of Queen's classic rock-opera song begins as a simple video conference that swiftly escalates into an all-singing, all-squawking frog-pig-&-bear-filled symphony of inspired Muppet foolishness. These Webby nominations come on the heels of "Bohemian Rhapsody" vying with X Factor and Rage Against the Machine for the Christmas No.1 spot in the UK. "Bohemian Rhapsody" is available as an MP3 download. In 2009, the global Web community voted Beaker's performance of "Ode To Joy" as Best Music Video of the Year in the Webby People's Voice Awards.